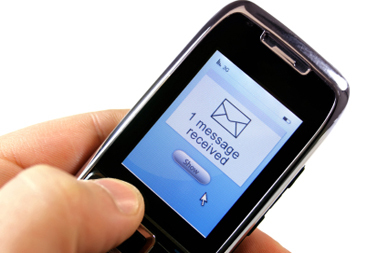 Some examples of how the text messaging service is typically used are displayed below. The “Sender Identification” on each message is branded with your hospital or surgery name, not an anonymous number. Examples include: “Surgery”, “Doctor”, “Hospital”, or “BUPA”. All messages are completely personalised to include the patient name and appointment time. You can even include the individual doctor that the patient is booked to see – it’s totally up to you! Receive a sample text to your phone! If you want to see how a message appears on your own mobile phone, simply text the word 'SMILE' followed by your medical centre - eg 'SMILE Kew Medical Centre' - to our shortcode number 88600. 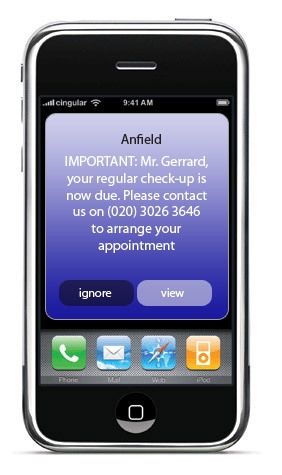 You will receive a free sample of a message reminder for Wayne Rooney!